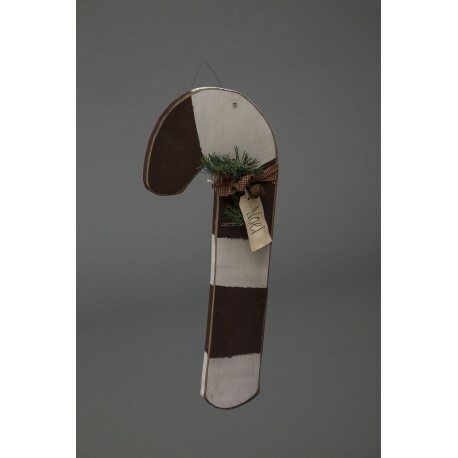 A great accent piece to any holiday or winter decor, this candy features a piece of fabric that hold a piece of faux pine garland, a small bell, and a hand written tag that says "NOEL." Pair this cutie with any of our primitive snowmen or the Wooden Stockings for an adorable whimsical primitive Christmas display! Add some rustic country charm to your home this holiday season with this handmade wooden, primitive hanging candy cane decoration. This 24" candy cane provides the perfect touch of holiday cheer displayed on your front door, in your home, or anywhere. This sweet hanging stocking decoration will raise your spirits through the holiday season and all winter long.